So, it’s Lent. I have a love/hate relationship with Lent. I love that it is a special time, set apart for self-denial, reflection, prayer and renewal. Unfortunately I also struggle with Lent for the same reasons. I love the thought of simplifying my life and meeting God in the quiet–I just continually fall short. I wanted a visual reminder in my own home, so I came up with this little project. It’s easy, takes just a few supplies and some patience. Step 1: Mark the design on your board. A cross was easy, just two lines. Mark along the edges of the cross every 1/2 inch so you know where to place the nails. Then, hammer nails into the wood. As you can see, mine are not perfect–far from it–but this won’t be so noticeable when it is completed. Step 2: place paper heart pattern in the center of the cross and pound nails in all around it. My nails were much closer together around the heart so that the thread would “fill” it in more completely. Step 3: Once all of your nails are in place, spray paint the entire thing, making sure to also spray paint the nails. Step 4: When dry, pull out your thread and start wrapping! I did the body of the cross first. To start, tie the end of the thread to a nail. Then, trim the end so it wouldn’t be noticed. There is no specific process for doing this. Just make sure that each nail is wrapped around, the outline of the cross is clear and the space within the cross is relatively filled. When done, tie the end of the thread to a nail and trim short. Step 5: Now it’s time to wrap the heart. I wrapped this much more completely. I really wanted the red of the heart to pop–a reminder of how Christ loves us, something especially clear during Lent. As you can see I wrapped the nails of the heart with both colors of thread, red on the inside and white on the outside. When done, tie off. As an added element, it is powerful to reflect on the crucifixion of our Lord while completing this project, especially while pounding the nails. Your creativity is only matched by your obvious faith. Great project. I love your finger puppet idea too. that is such a wonderful thing to hear. thank you! This is beautiful! I admire your creativity and passion for crafts. Keep it up! You’re inspiring people. Teresa recently posted…Do you want to win over breastfeeding challenges? You are so wonderful to say that! Thanks for stopping by! A visual reminder is such a neat idea! It makes me think I should “decorate” for Lent. I’ll have to try out your project. Wow, you are way craftier than I am! I love this idea, and think it’s wise to have a visual reminder. Unlike the “cross in my pocket” which I really only think about when I’m putting a wrapper in my pocket or something 🙂 – this is much more tangible. Stopping in and spreading the love from the link up! I will have to save this post so that I’ll have it next year when my (then) 13yo will be at loose ends for a project to inspire him for lent. It looks like it’s right up his alley! Of course I may just have to make one of these myself next year as well LOL. Great idea!! I love this. What a beautiful reminder!! I just might have to get hubbies help when he comes home to make one as well. I hope yours turns out great! thanks for stopping by…and have a blessed Lent. Aren’t kids wonderful? Last year I was talking to my 6 year old nephew, asking him if he was excited for Easter. He was, but when I mentioned the Easter bunny and candy he gave me a look like I was really dumb. What are you excited about then, I asked. He smiled, “Jesus raising from the dead!”. Oh yeah. That’s what’s exciting about Easter! Thank goodness for kids! I love this. I wanted to try this out with a very large heart. Absolutely Lovely! This would be a neat project to do with my boys, too. I love this – thanks for sharing. This is such a great idea … it’s got such a cool look to it! Wonderful idea! 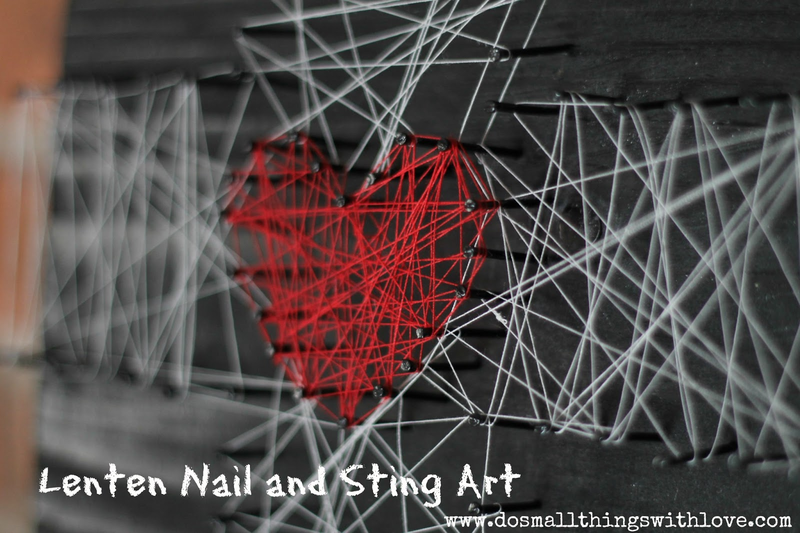 I haven’t worked nail and string art in a very long time, but I have fond memories of it as a craft. I love how meaningful your project is and what it represents. What a perfect reminder! Thanks! It’s nice when a craft is more than just a craft. Such a neat idea!! What a great tie-in with the nails too…nice one. That is awesome! Great reminder of the season.